At InfoTrack, one of our core values is that we care about the clients we work for and nothing makes us happier than being able to make a difference in a client's life. Frank Dyball is a client that we were able to help out with a unique story that we couldn't help but share. 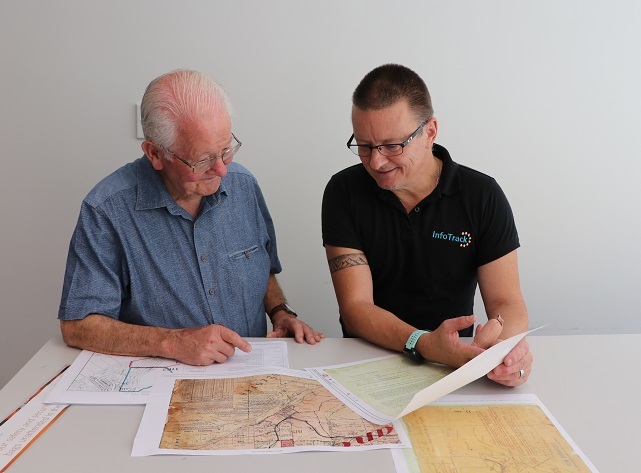 Frank has been interested in discovering more about his family history for the past 20 years, having conducted his research in bits and pieces, but meeting many roadblocks along the way. His quest has taken him to cemeteries around the world (England, France & Belgium to name a few), the State Library of New South Wales, and a number of online search engines. He has found vital documents that he had to handle with gloved hands and traced movements of his great-grandparents through history. Recently, his curiosity brought him to our doorstep here at InfoTrack. Frank wanted to find out more about his grandfather's dairy farm, particularly the exact date the land had been acquired, when the land had been transferred to his parents and how it had ultimately been disposed of. He spent some time at the Land Titles Office but couldn't find the information he was looking for and was given a list of information brokers he might be able to get additional help from. Luckily for us, he happened to walk by our offices and recognise our address from that list. Frank met with Mark Groll, InfoTrack's Old System Searching Specialist, and was quickly impressed by Mark's expert knowledge of land identification and his ability to trace the history of transactions related to particular plots of land. 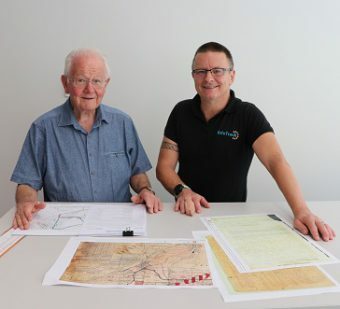 He relayed to Mark what he was searching for, drew him a diagram of the land as he remembered it and sent a follow-up email with some additional information. On the left is Frank's diagram and on the right is an aerial of the same land based on Mark's research. The Cadastral Record and Deposited PLan for Frank's grandfather's land. Within a day or so, Mark called Frank in to show him what he'd found. Frank was expecting to receive just the dates of the transactions but got so much more including the original Crown Grant, registered mortgages, extra adjoining blocks acquired, sales of a partial interest, prices and of course the sale out of the family with details of the purchaser. For Frank, it was a treasure trove of information and will be a great asset to the book he is writing on his family history. Frank (left) and Mark(right) reviewing the findings of Mark's research into the chain of title of Frank's grandfather's farm.